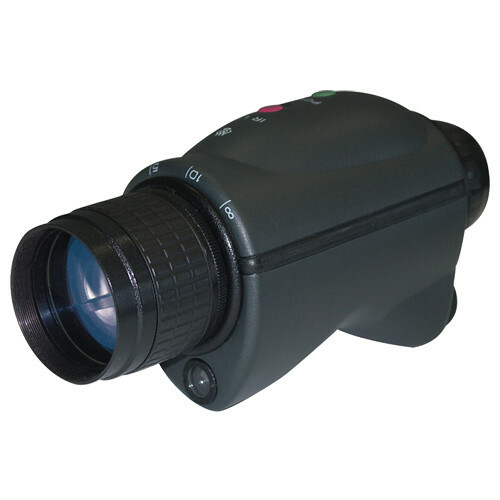 The Phantom 2.3x42 Night Vision Monocular from Newcon Optik is designed to address any military, law enforcement or other professional user requirements to see under the darkest conditions. A waterproof, compact and affordable generation 1+ unit. There are many different variables that effect the distance that one can see with a nightvision device, among them the object's size, the level of details being sought from the object and the conditions of observation. Nightvision devices detect much further under a full moon and clear skies than they will under a new moon and cloudy skies. Many different formulas are used to determine the statistic of maximum viewing range and this varies by manufacturer, so ultimately the generation of the intensifier tube is much more relevant than any quoted statistic when determining the maximum viewing range. All nightvision devices sold by B&H have mechanisms in place to protect the intensifier tube from a sudden burst of bright light, but this does not mean that bright light doesn't damage the device. No matter what, bright light in any form is not good for the longevity and performance of image intensifier tubes. Rugged, waterproof housing that floats!